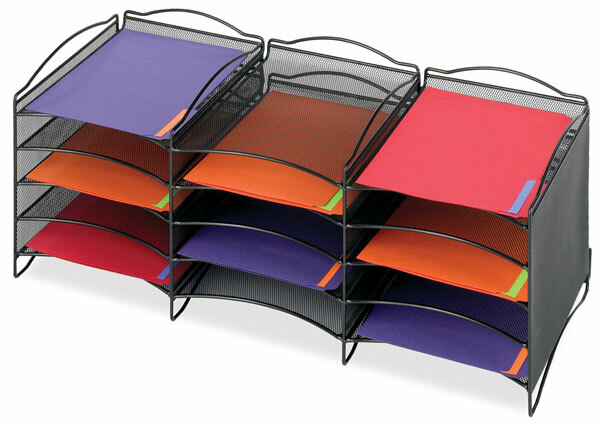 Crafted of steel mesh with a classic Black finish, Safeco Onyx Mesh Organizers are both stylish and practical. Best of all, they are all collapsible for easy storage in the studio, home, or classroom. Fold-Up Shelving Unit — Shelving on the spot! This three-shelf unit unfolds to provide sturdy, durable storage for books, binders, and reference materials wherever you need it. The bottom shelf has tracks for two letter-size file folder bins, which are included. File Cart — This cart has a sturdy tubular steel frame and four swivel casters (two locking). A letter-size file cube keeps paperwork within easy reach while two storage drawers are perfect for storing art and office supplies. Simple assembly is required. Compartment Paper Organizer — This smart, efficient organizing unit features 12, 1¾" horizontal pockets for holding letter-size file folders or papers. Connector clips are also included that allow units to be easily stacked two high. Desktop Tubs — Tote your stuff in style! From files and mail and art supplies, these tubs hold it all. They have integrated handles for easy carrying and come in quantities of six. Large tub legal-size). ® Safco is a registered trademark. ™ Onyx is a trademark.